By Barbara Sobel on April 5, 2019 Comments Off on ABBA Fans Rejoice! Bjorn Ulvaeus Confirms the Band Is Back With New Music! 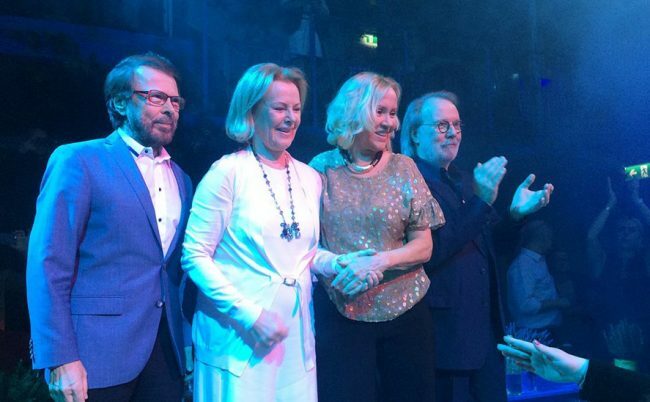 ABBA’s Björn Ulvaeus spoke with Denmark’s Ekstra Bladet and has confirmed the legendary Swedish pop band will be returning in September or October with a new song. Ulvaeus said that new music from ABBA has been “delayed way too long” and it takes a “very long time” to make a video which features avatars that are holographic of the band. ABBA revealed their plans to drop two new songs in April 2018. Earlier, the band announced they would be embarking on a tour which would be digital. The tour would feature “Abbatars,” which would permit Ulvaeus and the other members of the band Anni-Frid Lyngstad, Benny Andersson, and Agnetha Fältskog to look as they did in the 70s when the band was popular. The decision was made to embark on an exciting ABBA tour had one unexpected consequence. The four band members felt after 35 years; it would be great fun to reunite in the recording studio. So we all did. It was as if time stood still for all of us, and we were away on a brief holiday. It was a joyful experience! We may have all come of age, but the new song is fresh and new. It all feels good. The new ABBA track entitled “I Still Have Faith In You and Don’t Shut Me Down,” is the band’s first new release in close to four decades. In 1974 ABBA shot to international stardom after singing “Waterloo” and winning the Eurovision Song Contest. The band became one of the most popular of all time, selling over 400 million albums and singles worldwide, before breaking up in 1983. FirstPost: ABBA Fans Rejoice! Bjorn Ulvaeus Confirms the Band Is Back With New Music!